Individual weapons in a variety of points, shapes, and sizes to practice Shurikenjutsu (the art of throwing a shuriken). Being able to hit your target consistently takes practice. But once you get the hang of it, you'll be hitting your target every time. Star throwing can be made into a fun backyard competition. All it takes is your stars and something to throw them at, such as the target board. 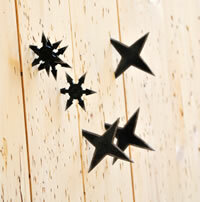 These ninja stars are heavy duty professional shurikens. Most of these come with their own carrying case that has a belt loop for easier carrying.